People always concern about the tendency of new iPhone, for now the new iPhone XS, iPhone XS Max, iPhone XR, and may be interested in new iPhone prices (preis, prezzo, precio), release date, specs and new features. But watching movies an videos on iPhone is always the common concern. Although the iTunes Store offers numerous of movies on your iPhone, they are billed. You can turn your own DVD collection into digital copies that can be transferred to iPhone iPad for playback. 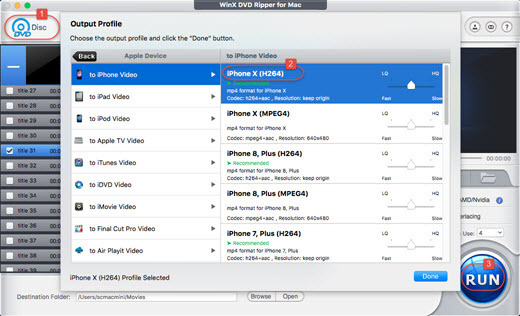 WinX DVD Ripper Platinum is the best DVD to iPhone converter with the most complete profiles for every iPhone and iPad models. Without the need to set video formats, codecs, resolution, aspect ratio, bit rate, frame rate, you can easily rip any DVD to an iPhone friendly digital video file in MP4 (H264/MPEG4) format. Read below to learn the best way to rip DVD movies to iPhone with professional iPhone DVD Ripper for Mac and iPhone DVD Ripper for Windows. WinX DVD Ripper for Mac/Platinum - The best software for ripping any commerical DVD movies to iPhone 6-Xs on Mac and Windows. For Mac and Windows only. If you are a mobile user, please click here. What is the Easiest Way to Play back DVD on iPhone XS (Max)/XR/X/8/7/6? Question: "I have converted DVD files to Apple recommended MP4 format, loaded them into iTunes, but then when I tried to transfer the DVD videos to my iPhone X, a message appears saying that this format cannot play on this device." Answer: Not all MP4 videos can be imported and transferred to iOS devices like iPhone, iPad and iPod Touch, because each gadget has different aspect ratio. It means that iPhone only accepts MP4/H.264 videos with fixed parameters. For ripping DVD to iPhone XS Max, iPhone XS, iPhone XR, the flagship iphone with newest technology and largest screen, many DVD rippers may be defeated except a few with powerful and up-to-date performance like WinX DVD Ripper for Mac (also has a Windows version). WinX DVD to iPhone X/8 Ripper is keeping pace with latest technological dynamics, be it the eighth or following generations of iPhone. Without the assistance of other decrypter or converter, it can rip copy-protected DVDs to iPhone X/8/7/6 friendly videos. * Mac edition is compatible with Mac OS X Tiger/Leopard/Snow Leopard/Lion/Mountain Lion/Mavericks (10.9)/Yosemite (10.10)/macOS (High) Sierra, Mojave. After installing and launching this Mac DVD ripper, you may begin to import your DVD movie content. You only need to click "DVD", "+", or "ISO" button to achieve this. But please make sure you have a DVD disc, VIDEO_TS folder or ISO image file on your Mac. More advanced and convenient than many other DVD converters, this DVD ripper for Mac has preset profiles for different Apple phones, say iPhone 4/4S, iPhone 5/5S/5C and iPhone 6/6s, Plus, iPhone 7, iPhone 8 (Plus), iPhone X, iPhone Xs (Max), iPhone Xr. Once having it, you don't have to bother with the complicated parameter settings by yourself. But if you need to adjust the video audio parameters for bigger/smaller output file size, you are also free to go. After the two steps above, you are enabled to start the easy and fast DVD to iPhone X/8/7/6 conversion via hitting the "RUN" button. You can also stop it at any time. * DVD to video conversion: Convert DVD to MOV, MP4, M4V, AVI, WMV, FLV, iTunes, etc. * The options for other devices: Rip DVD to other iPhones, or iPad, iPod, Apple TV, Android, WP8, hard drive, USB, etc. * 1:1 DVD Backup: Clone DVD to DVD folder, ISO image, MPEG2 and MKV video with full title. * DVD title edit: You can crop video, trim video, merge titles and attach own SRT subtitle files in any languages. * Better quality or speed for conversion: "Use High Quality Engine" or set "Deinterlacing" is for better image quality, "Safe Mode" is to avoid A/V out-of-sync problem and "CPU Core Use", "Hardware Accelerator" are for faster DVD to iPhone ripping speed. Rip movie DVD to MP4, AVI, WMV, MPEG, iPhone, iPad, PSP, Android/Microsoft and more on Windows and Mac OS for different uses. It also clones a DVD to ISO image file/DVD folder/MPEG2 file fast without quality loss. It supports any types of DVDs! For Mac and PC only. Go to mobile page. Garner the best free DVD to Apple TV ripper for Windows (10) for play DVD back on Apple TV 3/4 without trouble. In this article you can learn how to stream DVD to Chromecast 2 for watching DVD movies on HDTV even without downloading a DVD player. Part 1What is the Easiest Way to Play DVD on iPhone Xs etc. ?